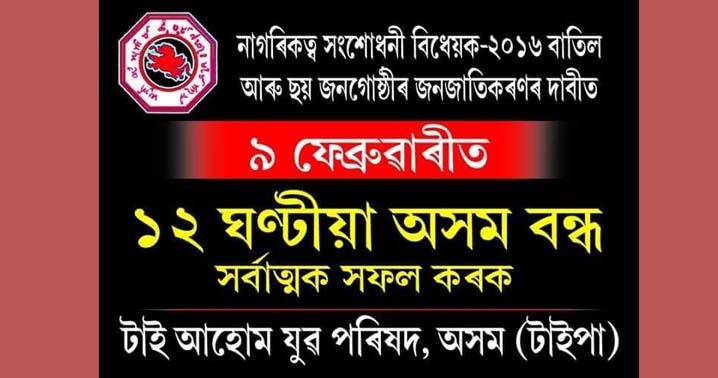 Demanding scrapping of the Citizenship Bill and ST categorisation of the Tai Ahom community, the Tai Ahom Yuva Parishad, Asom (TAYPA) has called for a 12-hour Assam bandh on Saturday. TAYPA has called for the bandh on the day when Prime Minister Narendra Modi, who has already arrived at Guwahati, is scheduled to launch a number of projects in northeastern States – Assam, Arunachal Pradesh and Tripura on Saturday. Modi will start his NE tour from Itanagar in the morning on Saturday. From Itanagar, PM Modi will return to Guwahati where he will lay the foundation stone of North East Gas Grid to ensure uninterrupted availability of natural gas across the region and boost industrial growth in the region. The grid is part of Government’s plan to provide cheap and quality gas to the entire North East Region. He will also lay foundation stone of City Gas Distribution Networks in Kamrup, Cacher, Hailakandi & Karimganj districts. Besides, Modi will perform Bhumi Puja for the AIIMS at Changsari on the outskirts of Guwahati and address a public rally on Saturday. The bandh call has been supported by several ethnic organisations like Krishak Mukti Sangram Samiti (KMSS), Ahom Sena, Asom Jatiyatabadi Yuva Chatra Parishad (AJYCP), Ahom Jatiya Gana Manch and Anusushit Jati Chatra Santha. It may be mentioned that an unknown circle wrongly publicised that the bandh call was withdrawn by TAYPA. The unknown circle also circulated a false press release having signatures of TAYPA in-charge general secretary Deodhai Phukan and publicity secretary Gunakanta Gogoi stating withdrawal of the bandh. But the organisation’s central working president Lohit Gogoi made it clear that the organisation has not lifted the bandh and urged the people not to believe in rumour-mongers.